As we inch closer to the release of this year's most anticipated release, "Alvin and the Chipmunks: Road Chip" I thought it only appropriate to bring up another film that might garner some attention in the next month or so; "Star Wars: The Force Awakens." I know much hasn't been made of this film and it's flying under the radar, but to get everyone in the mood and to be completely original, it seemed time to take a look back and discuss the previous six entries in the "Star Wars" franchise and do a little retrospective. 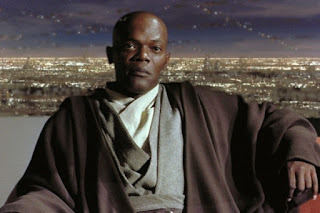 While many people don't like to admit that they exist, the "Star Wars" prequels do in fact, and they are canon to the entire "Star Wars" universe. Sorry people, but they do. 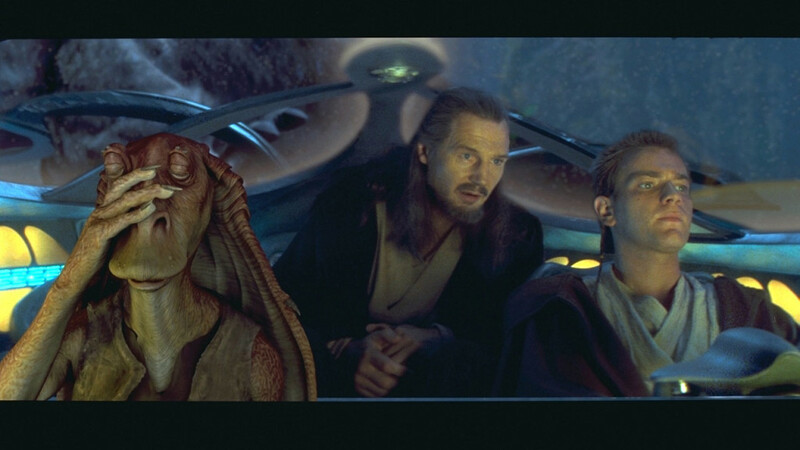 With that being said, let's start ripping the band-aid off right away and jump right into 1999's "The Phantom Menace" released 16 years after "Return of the Jedi." "Phantom" takes place 32 years before "A New Hope" and regales the audience with the story of trade agreements, treaty signings, bartering for parts of a ship, diplomacy, Jedi Council meetings, oh, and some lightsaber action. If you're a big fan of intergalactic politics, you might find some fun in "Phantom," but for most of us, even the biggest "Star Wars" fans will find the fun and will mostly be yearning for what came before in the later "sequels," and by sequels I mean the original three films. During "Phantom" we meet some old faces, just younger; including Jedi in training Obi-Wan Kenobi, the Padawan learner of Jedi Knight, Qui-Gon Jinn, Senator Palpatine who will eventually become Emperor Palpatine in the later films, and of course Anakin Skywalker, the one who was thought to bring balance to The Force, but instead turned his back on the Jedi order and would become Darth Vader. The main issue with "Phantom" and there are plenty, is the gall of it's creator, George Lucas, to expect old fans of the series to like what he likes no matter what. Sure, I get it, the original trilogy was written at a different time and place. The 70s and 80s were interesting time, and while studios had priorities like selling toys, lunchboxes, collectible cups at McDonald's and Burger King, the 90s brought about a time where not only were the kids that grew up with "A New Hope" and "The Empire Strikes Back" now adults, but many of them were wealthy adults, or at least man-children, that would eat up collectibles like candy. Not to mention, most of these adults now had children that only had to point at something they saw at K-B Toys (yes, K-B Toys used to be a thing) and it was rung up at the cash register. While I blame Lucas for 90% of what you end up seeing on screen, there is plenty of blame to go around with yes-men/women and plenty of people that would not say no to the all-mighty Lucas who created something so beloved and everlasting that nothing we could do would be wrong. Well, hindsight is 20/20 and with the rise of the Internet, "Phantom" has gone down as not only one of the worst films in the "Star Wars" Universe, but some might say one of the worst films ever made. The relationship between Qui-Gon and Obi-Wan is the heartbeat of the film, albeit a weak one that isn't fully explored or fleshed out. It's clear that both Ewan McGregor and Liam Neeson are trying their best with what they've been given and knowing the lore of "Star Wars" the relationship between a Jedi and his Padawan learner is a powerful thing, I just wish there was more to it. The seeds are planted early that Obi-Wan and Qui-Gon often are at odds, especially about taking Anakin to Coruscant to showcase him in front of the other Master Jedi, but there is that mutual love and respect between the two, as well as the student and teacher motif, that while it may seem lame, makes a more profound effect later on in "Revenge of the Sith." Darth Maul also makes a decent showing, even though it's far too short of one. In the original trilogy the only bad guy you worried about was Darth Vader. 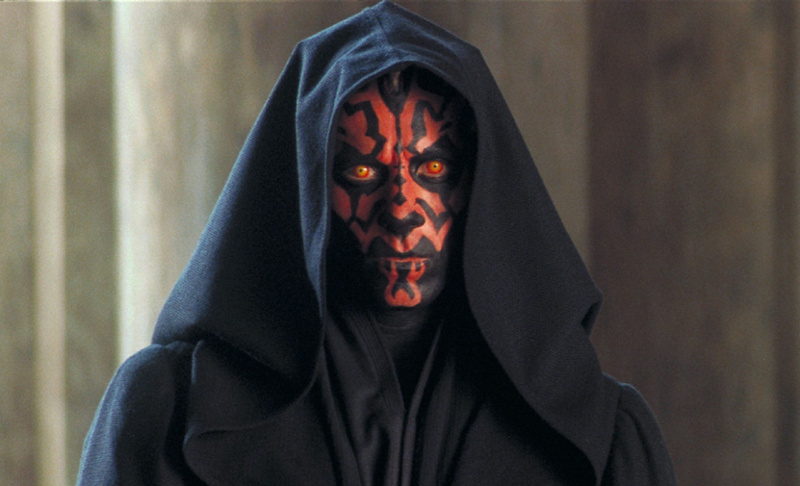 Sure, Boba Fett was cool, and I would almost call Maul the Boba Fett of the prequel series. While we get to see so little of him, he was turned into somewhat of a cult figure in the series, much like Fett himself. 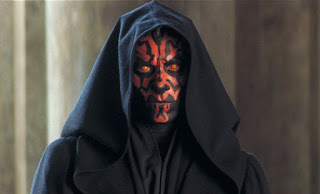 There is no denying that the final lightsaber fight between Maul, Obi-Wan, and Qui-Gon is the highlight of this film, it was so much a highlight that later we would get prequel books about the origin of Maul and the inevitable return of Maul as a half Sith, half robot with spider-legs, that was the appeal of Maul. Of course I could beat a dead horse, but outside of those few lone bright spots, "Phantom" is plagued by issues that turn a once proud franchise into a near "MST3K" quality film. From the pratfalls of Jar Jar Binks, to the neverending Pod Racer sequence, to the cringe-worthy dialogue spewed by Jake Lloyd as the future Dark Lord of the Sith, and of course the lifeless performance by Natalie Portman, this film lacks fun, goodness, and the goofy innocence of "Star Wars" films past and replaces it with goofy out of place humor and lifeless exposition that will leave many fans, like myself, hollow and yearning for nostalgia, or at least "The Star Wars Christmas Special." 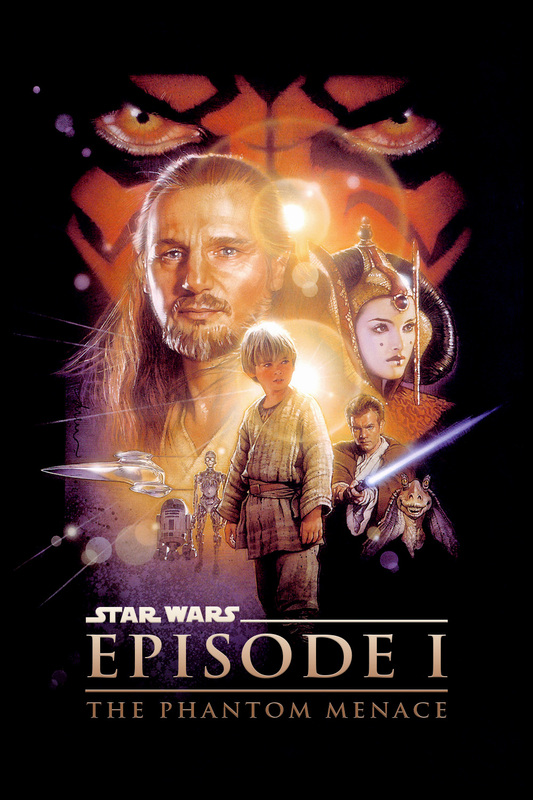 Stay tuned in the next few days for more "Star Wars" goodness as we move on to another winner; "Star Wars Episode II Attack of the Clones."